Bungalow for up to 6 people in its own garden near to the beach and town. 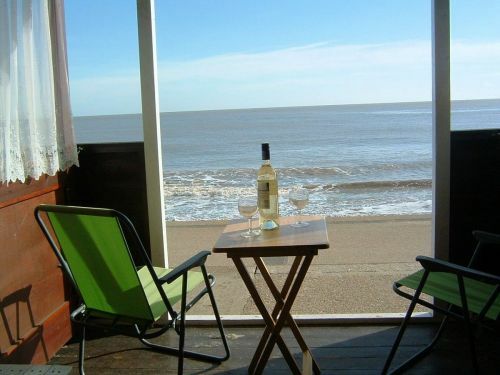 To complete your holiday,you can also rent our Beach Hut, 'Jennie'. View pictures of Holly Cottage. A delightful and comfortable Southwold bungalow which is available with the option of our East Cliff Beach Hut "Jennie", if requested. This chalet bungalow offers very good flexible accommodation and can be rented as 2 bedrooms, sleeping for 4 or3 bedrooms, sleeping for 6. The upstairs bedroom is available as an option for an additional £180 per week. The rooms are spacious, light and tastefully decorated. Maintained to a high standard by the owners it is well furnished and well equipped with a modern kitchen and bathroom. Situated in a spacious plot with a lovely enclosed garden, just two minutes from the beach and the award-winning pier, and close to the town centre. The holiday home is available for self-catering accommodation throughout the year on a weekly basis, including Christmas and New Year. Lounge/Dining Room: The spacious lounge/dining area is south-facing and looks on to the garden. There is a comfortable sofa and easy chairs, and has a SMART TV / DVD and a music centre. Kitchen: The modern kitchen is stylish and well-equipped with a breakfast bar, dual fuel cooker, hob, extractor units, grill, toaster, microwave, dishwasher, fridge/freezer and washing machine. Double Bedroom: The large double bedroom has dual aspect windows. There is a 5’ double bed with bedside cabinets and bedside lamps with radio. A double built-in wardrobe and chest of drawers provides generous space for clothes. Second Bedroom: This has two single beds, a wardrobe and a chest of drawers. Third Bedroom: Upstairs with delightful views of the sea and the pier. There are two single beds, a wardrobe and a chest of drawers. Bathroom: Bath with a shower over, wc, washbasin and shaver point. Garden: The enclosed garden and patio is ideal for relaxing and for al fresco dining where the morning and afternoon sunshine can be enjoyed. The central heating system is gas fired. There is an electric fire in the lounge. Gas and electricity are included in the rental price. There is ampleoff-streetCar Parking on the front drive and rear driveas the home is situated on the corner of Hotson Road and Marlborough Road. All beds have two pillows and a duvet. Bed linen and towels are all provided. Beds will be made and ready for your arrival. Please bring beach towels. There is a telephone for incoming calls and emergency numbers; free wifi is available. A 20% non-returnable deposit is required when making a booking. The holiday home is available from 4.00pm on the day of arrival; vacating time on the day of departure is 10.00am. The third upstairs bedroom with 2 single beds is available for an additional £180 per week. Easter, Christmas and New Year Breaks by arrangement. Beach Hut "Jennie" is available for £200 in high season (July - September); £180 per week for other months.